Scientists say that if we continue to catch blue fin tuna at the unsustainable rate that we currently are the fish will become extinct, as will all wild fish within 40 years if we continue to over-fish stocks. A new documentary film, The End of the Line, looks at the huge dangers our global fishing industry faces. As we continue to strive ahead with new advances in technology we are continuously over fishing. 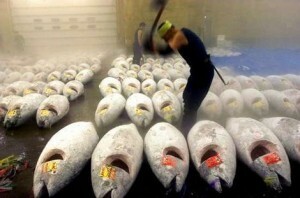 WWF, the wildlife charity predicted that the fish could disappear from the Mediterranean within the next three years. The End of the Line highlights that marine scientists recommend a legal catch of 22,000 tonnes but that conservationists believe in reality 60,000 tonnes are being caught. Astonishing considering the fish is endangered - as in rhino and blue whale endangered. Japanese company Mitsubishi (who have a 40% share of the world market in bluefin tuna) is already freezing huge quantities of the fish that can be sold in years to come. Sustainably fished product is the only way to go and most fishmongers should be able to tell you where exactly their fish were sourced from you just need to ask.